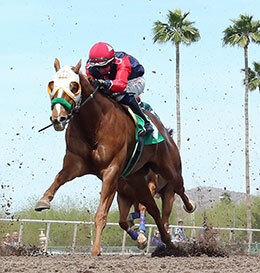 Unrestrained, under jockey Jake Samuels, drives to victory in the $36,575 AQRA President’s Open Spring Derby Sunday afternoon at Turf Paradise. 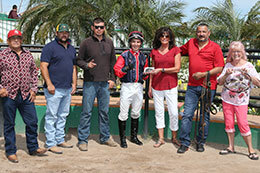 Unrestrained is trained by Jesus Olivas and is owned by Cristina Salas. He was bred in California by Ed Allred, by Kiddy Up and out of the Check Him Out mare Thinking Out Loud. This was the fourth consecutive win for Unrestrained and his fifth win in his last six starts. He debuted at Los Alamitos in July and competed in seven races before shipping to Arizona for the AQRA President’s Open Derby trial. In nine career starts, he has finished first or second eight time and his worse effort was a fourth-place finish. To date, he has earned $40,629. The top three fastest qualifiers finished in that order in the final; following Unrestrained was second-fastest qualifier First Lady Perry, who defeated third-fastest qualifier New Moon Dynasty by a nose. First Lady Perry was ridden by Mark Jasso for trainer John Allred and owner Scott McDaniel. First Lady Perry came from behind to edge out New Moon Dynasty at the wire for her fourth career second-place finish. She has three wins in nine career starts, including the $48,735 AQRA Turf Paradise Futurity in December. First Lady Perry was bred in Utah by McColee Land & Livestock, by Mr Jess Perry and out of First Lady Amber, by Heza Fast Man. Alan Hernandez was aboard New Moon Dynasty for trainer Joe Bassett and owner Bobby Simmons. She was bred in New Mexico by Dosi and Norma Alvarez. New Moon Dynasty is by FDD Dynasty and out of the Major Rime mare Nagano Moon, making her a half-brother to multiple graded stakes winner First Moonflash. Completing the field were El Saucito, Ur My Favorite, Jessa Cat, Im Rocket Man, Moonflash Deluxe and Wrecking Ball. Wonderland was scratched.